If you subscribe to daily email news letters they can quickly fill up an inbox. You might want to save them to read or reference at a later time. Keeping these emails in specific folders is a good way to keep organized. 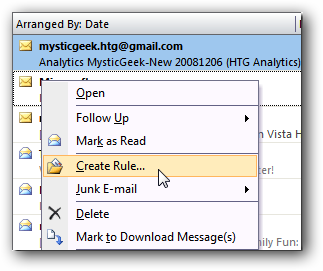 Today we will take a look at how to create a rule in Outlook to automatically place regularly received email messages in specifically assigned folders. 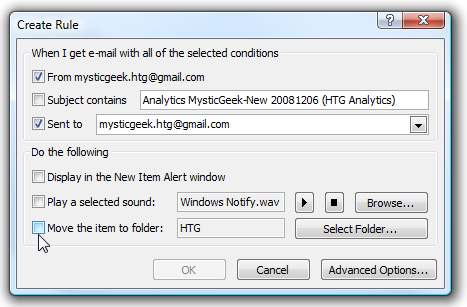 First right click on the email message you want to move to automatically move to a folder and select Create Rule. This will open up the Create Rule screen so we can choose the conditions for this email. Depending upon how you have your mail set up (Exchange, Gmail, etc) will determine what to select for the conditions. Most of the time I set the rule by sender to one of my email addresses. Also, you can add visual and sound notifications. After you have selected the conditions the next thing to click is “Move the item to folder”. Now browse the folder location you want the email to be sent to or create a new one. Click OK in the Create Rule window then OK on the following confirmation dialog box. That’s it, now all daily emails will be sent to a specific folder. 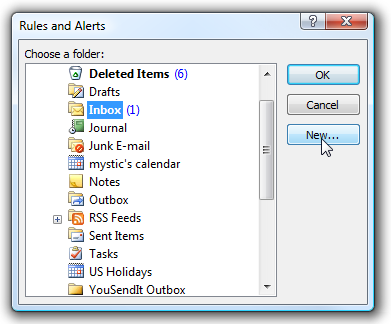 This is just one of many helpful rules you can create in Outlook to stay organized.